Wait for today When we make you say "ooh!" No children under the age of 18!! A VALENTINES EXPERIENCE WITH A DIFFERENCE! Stalls available, demos, speakers corner, prize for best anti-valentine poem, food and drink, awesome prizes and live music. 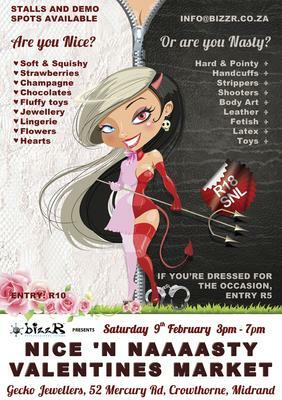 Cost: R20 per entry, enter on the day at the bizzR stall, prize giving at 7pm! Stalls available from R100 ea - LIMITED SPACE!! Food stalls welcome, all manner of really romantic or deliciously deviant goods, products and services welcome. Join in and write your own page! It's easy to do. How? Simply click here to return to Pretoria Events February.